I went to life drawing for the first time in many months yesterday and it was rough! I felt out of figure drawing practice for the first couple of poses but then I found my groove and things became more comfortable. Sort of like riding a bike I suppose. I haven’t done much art at all this week. I’ve been busy with work and most of my spare time has gone into playing Dragon Age Inquisition (again). I have such an addiction to games sometimes. But here are a few ATCs made recently. 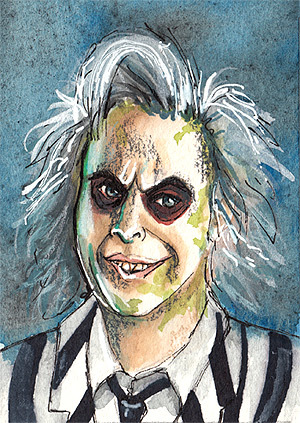 Beetlejuice is watercolor and ink and the Star Trek TOS cards are in marker and ink for a swap on IllustratedATCs.com. Hope everyone has a great weekend! It’s raining here but soon to clear, just in time for the weekend. Happy PPF. < Goth Girls and a rooster, not together. Congrats on being artist of the week on PPF. Your life drawings are always so good. Your work is awesome as always. Congrats on being featured. 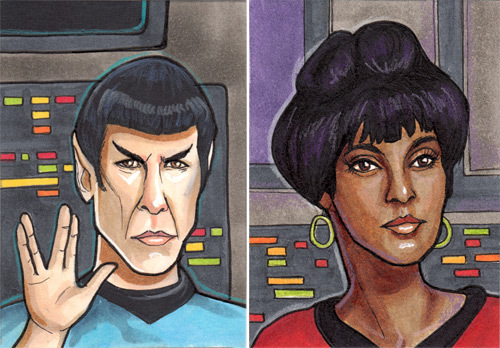 I love your Star Trek. I actually love all your work. Have a wonderful weekend and I wish it would rain here. So wonderful artwork again even you didn't spend much time -happy PPF! Congrats on being featured Sal! Love your drawings of model.Congrats for being featured in PPF! Isn't it strange how you can lose practice and suddenly have trouble doing things you did without a problem just a few months ago!? It always surprises me. It's good that you got back in the groove again 🙂 And congrats on being featured! I LOVE your ATCs. I need to check out that site you have your ATCs in. I never know what to do with mine, ATC/ACEO. I love your site and am a new follower! Happy PPF and congrats for being spotlighted! And that is one awesome rooster! wonderful still life drawings and congrats on your PPF feature this week! Love the Beetlejuice Sal, and also Star Trek. I've got to get back into blogging again. I see I have missed a lot. Really impressive work indeed. Greetings! Impressive drawing! Love the hand in his face!